You can graph functions fairly handily using a graphing calculator, but you’ll be frustrated using this technology if you don’t have a good idea of what you’ll find and where you’ll find it. You need to have a fairly good idea of how high or how low and how far left and right the graph extends. 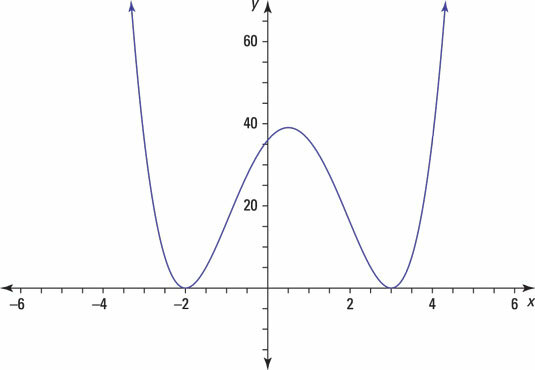 You get information on these aspects of a graph from the intercepts (where the curve crosses the axes), from any asymptotes (in rational functions), and, of course, from the domain and range of the function. 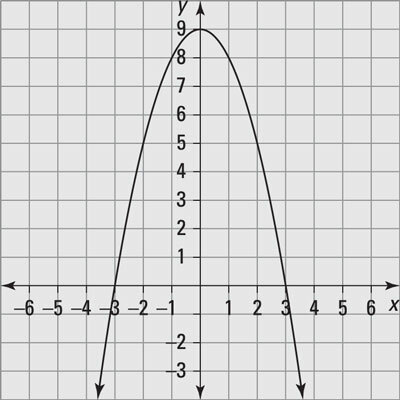 A good working knowledge of the characteristics of different types of functions goes a long way toward making your graphing experience a success. Another way of graphing functions is to recognize any transformations performed on basic function definitions. Just sliding a graph to the left or right or flipping the graph over a line is a lot easier than starting from scratch. Given the graph of a quadratic function, write its function equation in vertex form, y = a(x – h)2 + k.
The vertex is (0, 9), and the graph opens downward. Using the vertex form of a quadratic equation, y = a(x – h)2 + k, these characteristics are represented by y = a(x – 0)2 + 9, where a is a negative number. So the equation of the parabola is y = –1(x – 0)2 + 9. Determine the intercepts of the graph of the polynomial. Then sketch the graph. Find the x-intercepts by letting y = 0 and solving for x. The x-intercepts of y = (x – 3)2(x + 2)2 are (3, 0) and (‒2, 0). Find the y-intercept by letting x = 0 and solving for y. The y-intercept is (0, 36).